A police officer walks with a dog at Tekhnologicheskiy Institut metro station in St. Petersburg, April 4, 2017. 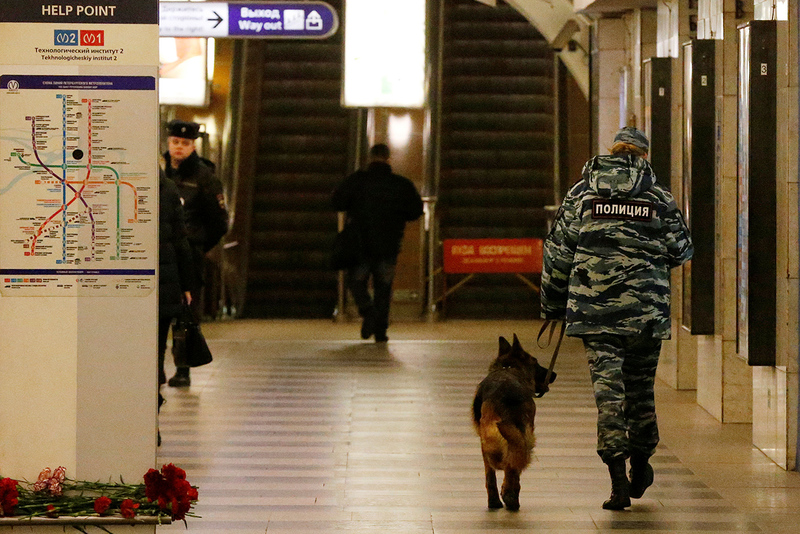 According to a source quoted by the Kommersant newspaper, Russian special services were informed of the St. Petersburg metro attack before it took place by a Russian national, who had collaborated with ISIS and was detained after returning from Syria. He reportedly knew several members of a sabotage group sent to Russia from the Middle East but only maintained telephone contact with them. The special services' informant was at the lowest level in the militants' hierarchy, the source told the newspaper. "Having thus identified and gained access to the mobile numbers of the presumed terrorists, the operatives established that all sim cards had been bought at markets and were not linked to specific individuals, so all they could do in the circumstances was wiretap the militants' conversations, hoping to eventually find them or at least to learn details of their plans," the newspaper reads. The terrorists rarely used mobile phones and when they did they allegedly only spoke in short sentences. Their communication was apparently interrupted after the first explosion – the telephone numbers known to the special services were blocked and this prevented a second explosion. According to the newspaper's source, the second terrorist panicked on finding himself without a telephone connection and left the bag containing the bomb under a seat. The source points out that this is still preliminary information and has not been officially confirmed. At the same time, an Interfax source in law enforcement says that early information suggests the blast in the St. Petersburg metro was triggered by a suicide bomber and his identity has already been established. Yet another source says the presumed suicide bomber was linked to radical Islamists. Investigators have established that the terrorist brought the explosive device into the metro in his backpack, the source claims.